Metadata can be included in queries by using their internal name. Metadata fields can have user permissions assigned. Note: Supported fields are those where index=un_tokenized OR analyzer=pureLowerCase analyzer. Metadata fields can be stored and indexed. Metadata fields can be used as a custom metadata field. All this technical information can be looked up in the metadata field information page of Elvis Server. In Elvis 6.12 and higher: access the page through the Management Console. The field information is grouped per category. The following example shows the information of some of the metadata fields of the File category. 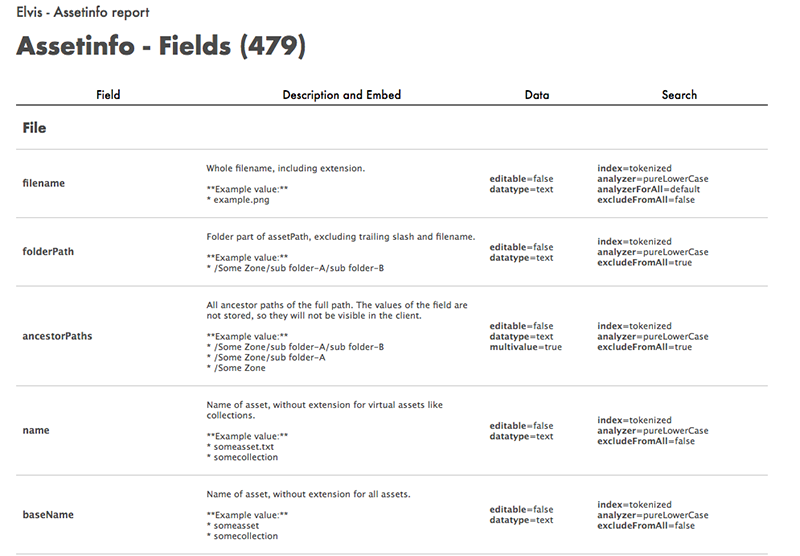 Folder part of assetPath, excluding trailing slash and filename. Name of asset, without extension for virtual assets like collections. Extension part of the filename (excluding .). Asset type, usually equal to extension unless the file extension is not mapped as an assetType, in which case it will use the 'unknown' assetType. 22 August 2018: Replaced the field information tables by a link to the page in Elvis Server.